From the many varieties of Bracken that originally existed, only one survived in Germany, the Westphalian Bracke. These were interbred with local Steinbracken, and one type evolved, which has been known since 1900 as the Deutsche Bracke, or German Bracke Hound. The Duetsche Bracke was recognized by the United Kennel Club January 1, 1996. 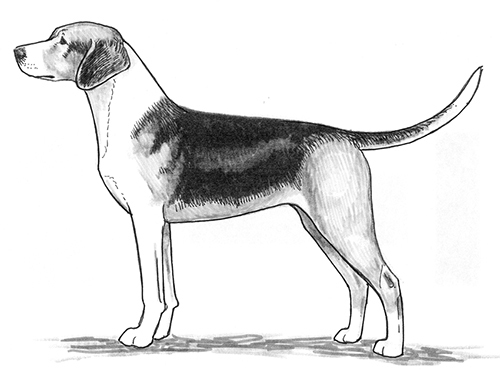 A light, high stationed, elegant yet strongly made hunting dog with a noble appearance. Fine, clean and long, with flat cheeks. The skull is slightly domed, and the occiput is not prominent. The stop is minimal. The bridge of the nose is very slightly convex. The lips are moderately pendant. The Duetsche Bracke has a complete set of evenly spaced, white teeth meeting in a scissors or level bite. The nose has a light, almost pink, strip in its center. The rest of the nose is dark. The eyes are dark and clear, with a friendly expression. The ears are long and broad, close fitting, and rounded at the ends. The neck is moderately long, and strong in relation to the head. The shoulders are clean, and the withers are high. The legs are lean, fine boned and sinewy, with close elbows. The chest is deep, reaching below the elbow. The ribcage is long. The back is slightly arched, and the croup falls away slightly. Fault: Long and low body shape. The upper thighs are broad and full in profile. The lower thigh is long, not very broad, and well angulated. Longer than cat feet, with very tight toes. Long, and not noticeably strong at the root. The tail has bushy long hair, and therefore appears heavy, yet it tapers to a point. It is carried down or upward in a curve. Dense, hard and bristly. Long, for a short haired dog. There is a brush on the tail and there are breeches on the hind legs. Red through yellow. with a black blanket or saddle, and white ‘bracken’ markings: blaze, white muzzle, white neck ring, white chest, legs and tip of tail. Height at the withers for males and females is 17 inches to 21 inches.